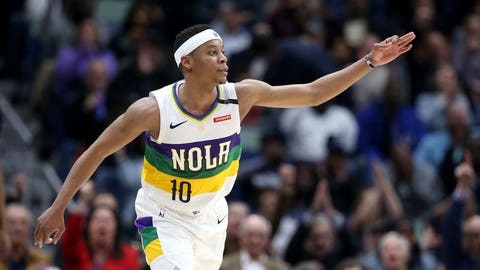 The Milwaukee Bucks signed guard Tim Frazier on Tuesday, addressing a need for depth at guard. Frazier played 47 games (17 starts) for New Orleans this season and averaged 5.0 points, 4.4 assists and 2.9 rebounds in 19.3 minutes per game before being waived Feb. 28. Frazier is no stranger to the Bucks organization as he appeared in four preseason games with the Bucks and was signed to a free-agent deal Sept. 22. Milwaukee waived the 28-year-old guard Oct. 15, just two days before the season opener. The Bucks need depth at guard after Malcolm Brogdon was diagnosed with a minor plantar fascia tear in his right foot over the weekend. Brogdon will be out indefinitely and isn’t expected back for six to eight weeks. The roster spot was opened after the Bucks waived Christian Wood on Monday. Milwaukee hosts the Los Angeles Lakers on Tuesday night at Fiserv Forum. The game will be televised on FOX Sports Wisconsin.